In Nov. 2006 JRX called me and told me about a Vader helmet on ebay. When I saw the pictures of the helmet, I immediately got in touch with the seller asking for more information about the backstory and additional pictures. The seller stated that "...the helmet originally belonged to her partner. It was given to him when he was a young boy by his uncle who worked on ESB as a fibro plasterer. The uncle made the majority of the helmets, masks etc.. The helmet was made either before or during the making of ESB and it was made for the stand in, but the helmet was not called upon, so it was given to the young boy." After I did extensive comparisons of the ebay helmet pictures with high-resolution screencaps and pictures from my personal archive, I decided to give it a try at the auction – and luckily I won! When the helmet arrived a couple of days later, I was thrilled. Except for the broken tusks it was in pretty good shape for being almost 30 years old. Some cracks here and there, some paint chipping etc.. It seemed that the gunmetal on the faceplate was painted in a rush. The colour of the gunmetal looked correct, although I was under the impression that the paint wasn’t mixed properly. The teeth were cut very deep, same with the eyes. It must have had lenses at one point, because there were glue traces left on the inside of the faceplate. Faceplate and dome were permanently attached with two thin strips of fibreglass. The top of the faceplate was free of fibreglass or bondo, and I was able to feel three tab casts with my fingers, although I couldn’t see them. Now the big question was: should I leave it as it is or separate dome and faceplate for further inspection? 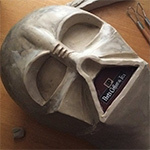 After some discussions with fellow Vader fans, I carefully separated dome and faceplate. The top of the faceplate was perfectly clean. The dome itself is very lightweight, just like the original domes in the LF archives. And for the first time I saw three intact tab casts on top of a Vader faceplate. That was a tough decision. Some people said I shouldn't touch the paint because it’s production paint – others voted for stripping the paint, because they thought that there might a good chance to find an original ANH faceplate casting under the paint. To be honest, I must admit that curiosity finally won over archaeological preservation. First I started to carefully remove the paint from the tabs using pure acetone. The result was amazing. I found out that there was not only a clearcoat, gunmetal and black paint layer on the faceplate, but a thick layer of white primer which filled all the bumps and scratches on the surface. When all this was gone, I had three extremely sharp tab casts in front of me – so sharp that even the brand and numbering was visible. It took me another 2 hours and approx. 4 liters of acetone until all the paint, primer and bondo was removed. When I received the TM faceplate, Tom had already stripped the paint and filler off with Acetone. After extensively studying it, I found various areas to have been filled in with black resin - possibly gelcoat. It appeared that the prop artist of the time had done so to pre-smoothen the helmet for paint work. Were these casting flaws he/she was filling up, or could they have been the very subtle imperfections associated with the screen-used helmet that we see in hi-def images of ANH? The most obvious damage to the faceplate were the broken tusk-tube tips. Those were my main "target" to restore or rebuild. The broken off areas were not too big, and the lower section of the tusk-tube tips was mostly unharmed. Even half of the original holes for the tusks were still there. After the tusk-tubes had been restored, I carefully started to flicker off the added-on resin from the teeth, the inside of the eye-sockets and some other areas. There were some additional holes and casting flaws on the faceplate that needed to be covered up carefully and cleaned again, and some areas on the faceplate had obviously been sanded (mostly at the sides of the face), but most of the original facial details had survived and remained untouched. It took a very long time to carefully do my best to not harm the original casting and just bring it back to look as if it was just pulled out of the mold yesterday - it was well worth taking that time. Since the restored original faceplate is now ANH style and unpainted, I didn't want to present it in combination with the original TM ESB dome. That's why I asked JRX to create an ESB faceplate based on the original restored TM faceplate. First, a silicone mold was taken from the original faceplate. After that, the original faceplate went in storage again, and JRX re-engineered the casting "back" to ESB, removing surface details from ANH and adding details from ESB such as the larger chin vent and a mounting ring. The finished ESB style faceplate was then combined with the original TM ESB dome. For many of us, Star Wars: A New Hope (ANH) was the first time we saw Vader, and the scene in which Vader boards the white-interior Tantive IV ship evokes profound emotions for many of us. Here is a test of the TM in an ANH-style setup as an experiment but also as a loving tribute to a film loved by fans around the world. Photo below: (Left) Screen-used ESB. (Right) TM in an ANH-style setup. So what you have in effect is a production made, but not screen used, Darth Vader helmet. You must be chuffed to bits to have snagged this on the bay. Congratulations and thanks for sharing the pictures and story. I am glad for the Vader fans that this piece has ended up with someone like you who is willing to share information and pictures with the community. It is karma that these pieces are residing in the collections of people like you and Thomas. Well what can I say? I could write a few pages on how much I love this helmet. Nice to have this back on The Den! It must have been a huge leap of faith to take the paint off but what you found below the surface is really amazing. Jesper did an excellent job with the restoration of the tusk and then the recreation back to ESB. Thanks for sharing Tom and Jesper. Very interessting to read the "making of" this helmet(s). It was also very easy to understand even for the none experts like me. Great pics also. Will we see more of them? As David stated, it took some major big ones to take away all that paint, but what a payoff. Thanks for the information and taking the time to do this. Great pics of a great helmet. what an amazeing peice.. i hope to see more of this helmet..
Great pics! Excellent work from JRX! Last edited by Vadermonkey on Mon Mar 03, 2008 8:11 pm, edited 1 time in total. I was pleasantly surprised to find something of this level posted here in this forum rather than in the Privileged section, making this level of information available to newcomers. When I joined the fandom a short while ago, much of the fandom lacked the knowledge of real and authentic props, and various figures and vendors in the community were able to take advantage of public ignorance. You've done this without any kind of ego, and you didn't try to "one-up" someone else's acquisition. This kind of sharing should really be what this community is about. Thanks, Tom, for making me a believer. Thanks Tom. Great acquisition and fantastic story about the helmet. Thanks for posting! I too would be happy to see more of this helmet. Great write up Tom....beautiful lid!